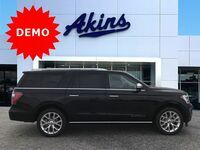 Sometimes the biggest isn’t big enough, which is when you need to take things to the MAX – or, more specifically, to the 2019 Ford Expedition MAX, which we’re proud to offer right here at Akins Ford near Atlanta, GA. Corniness aside, the 2019 Expedition MAX lineup truly is the best option out there for anyone who needs the most passenger and cargo space available in a large SUV. In fact, the 2019 Expedition MAX lineup provides interior space specifications that few, if any, other large SUVs can match. More specifically, the 2019 Ford Expedition MAX lineup provides you with 172 cubic-feet of total passenger volume, 34.3 cubic-feet of cargo space behind the third row, 73.3 cubic-feet of cargo space behind the second row, and 121.5 cubic-feet of cargo space behind the front row. The 2019 Ford Expedition MAX lineup is made up of three trim levels – the 2019 Expedition MAX XLT, the 2019 Expedition MAX Limited, and the 2019 Expedition MAX Platinum. All three 2019 Expedition trim levels feature the same 3.5-liter V6 EcoBoost engine, though the power ratings you get from that engine depend on the trim level you choose. 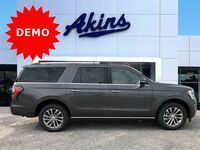 More specifically, 2019 Expedition MAX XLT and Limited trim levels offer 375 horsepower and 470 pound-feet of torque, while the 2019 Expedition MAX Platinum trim level offers 400 horsepower and 480 pound-feet of torque. It’s also important to remember that you’re getting far more than just a powerfully capable engine and a spacious interior when you purchase a new 2019 Ford Expedition MAX. That’s because the 2019 Expedition MAX lineup also features a bevy of advanced new safety, driver assistance, technology, connectivity, comfort, and convenience systems and available packages. This list includes a 3.13 non-limited-slip rear axle, a Class IV trailer hitch, a Cargo Package, a Connectivity Package, a Driver Assistance Package, an FX4 Off-Road Package, and a Heavy-Duty Trailer Tow Package. If you’d like to learn more about all the ways the 2019 Ford Expedition MAX is the perfect SUV for family road trips, weekend adventures, and daily errand runs, please contact our staff here at Akins Ford near Atlanta, GA.